Speaking Of Love – A Canine Groom! I’ve also married, in print at least, scores of doctors, lawyers, handymen and corporate chiefs, as well as athletes, bartenders, mortgage lenders and father-daughter pastors with conflicting theological beliefs. They all arrived in various increment to be stamped with a kind of sacred ink that makes them news fit to print. Nurses, actors, politicians, men and women in blue, soldiers, spacemen, musicians and M.B.A.’s and Ph.D.’s from N.Y.U. I thought I had covered every kind of “I Do,” including a few, I swear to you, exchanged by two who had been on death row. I know. I know. But believe me, it’s true. 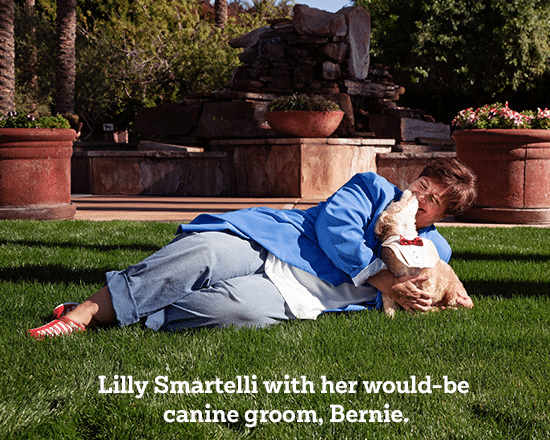 Then came a call that topped them all — from a public relations woman named Laurie Monteforte — about a woman named Lilly Smartelli, 55, of Phoenix, who is dreaming about marrying her best friend, Bernie, who happens to be her dog. The fact that there was only one human in this human-interest story that involved a bride and a groom had me thinking this was the mother of all publicity stunts. “I’ll write it in color,” I tell Ms. Wilcox after every assignment she gives me. My voice was full of sarcasm and doubt as I relayed the tabloid-like premise of Ms. Smartelli’s tale to Ms. Wilcox. So I called Ms. Smartelli, and she moved me in a most tearful way. She is terminally ill, suffering from a form of pulmonary fibrosis, a respiratory disease. Ms. Smartelli, who donated a kidney 12 years ago to a childhood friend in Detroit, is still trying to save lives, while at the same time, keeping alive her own childhood dream: to know the joy of a wedding day. With no significant other in her life, she chose Bernie, a 9-year-old cocker spaniel-poodle mix, to stand in as her groom. “It would all be in good fun,” she said. Ms. Smartelli, who maintained a sense of humor throughout our conversation, wondered what her wedding announcement might look like in The Times, so I obliged her. Lilly and Bernie were married on Valentine’s Day at St. Bernard Church in New York. The Rev. Jack Russell, one of man’s best friends, officiated. Mrs. Bernie, 55, who was radiant in a bone-white gown, and Mr. Bernie, 54 (dog years), flealess in a rhinestoned collar, exchanged puptials before a litter of family and friends. The bride, who graduated from Wayne State University in Detroit, was a travel nurse. The groom, who graduated from Obedience School, works from home, keeping the yard free of squirrels. The couple met in Palm Springs, Calif., in October 2011, during a county fair adoption for shelter dogs. “He couldn’t keep his paws off me,” the bride joked. Ms. Wilcox liked what she heard after I told her about my interview, and let me write the story about Ms. Smartelli and her dog, Bernie. Hers is a poignant, and colorful, tale.